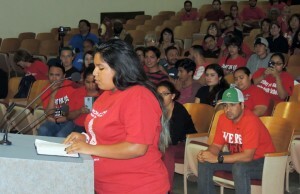 Unión del Barrio congratulates the Association of Raza Educators (ARE), community organizations, all committed individuals who participated in the victorious Ethnic Studies NOW campaign in San Diego, California. 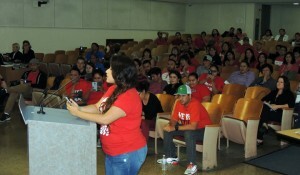 We are especially proud of our Comité Local Francisco Villa – the internal committee that coordinates the work of Unión del Barrio in San Diego, for leading the campaign to win Ethnic Studies classes for all San Diego Unified School District (SDUSD) schools. This is a major accomplishment and represents an historic victory for the people of San Diego – in particular the young people of our communities who for too many years have been denied access to their own histories within the public schools of San Diego. This victory would not have been possible without the dedication and sacrifice of UdB compas who took the lead of this struggle. Unión del Barrio holds firm to the principle that real political power only emerges from organized and sustainable work in our communities. It is this principle that motivates Escuelita Aztlán, our Saturday School in San Diego, which is now being expanded to Los Angeles. 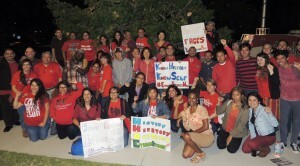 Likewise, this victory builds upon the November 2014 Ethnic Studies victory in Los Angeles, and the July 2014 victory in Pico Rivera, California when El Rancho Unified School District become the first school district in the entire state to adopt Ethnic Studies as a requirement for high school graduation. 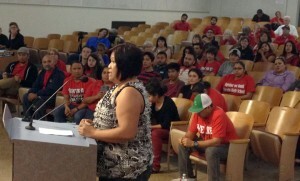 Today, we are proud to recognize members of Unión del Barrio that have played a leading role in each of these victories, and now have made San Diego Unified School District the second major district in California to move forward towards making Ethnic Studies a requirement for high school graduation. This campaign is proof that a liberation organization like Unión del Barrio can lead – and win – a struggle on a regional level, and undertake this struggle with complete financial and political independence from the Democratic Party and its affiliates. We are aware of the national implications of this victory. Inspired by these campaigns throughout Southern California and seeking information on how to reproduce them, educators, students, and community activists from throughout the country have been contacting UdB comrades that have played a leading role in this campaign. This victory proves that in spite of the flood of repression and poison our communities are continuously subjected to, we can still secure a collective victory that is directly linked to a legacy of struggle that extends back to Brown v. Board of Education and the Lemon Grove Incident. Unión del Barrio continues to find inspiration within the Chicano Power and Black Power movements of the 1960’s and 70’s, and it is our intention that our communities recover this historical legacy of struggle because it belongs to all of us, and it is this part of our collective memory where we find our greatest historical achievements, and from which our people’s power is born. We must not fail to mention that we also draw inspiration from our sisters and brothers in Arizona who continue to struggle and resist reactionary racist aggression in their defense of Raza Studies. ¡Felicidades To Our Compas In San Diego! 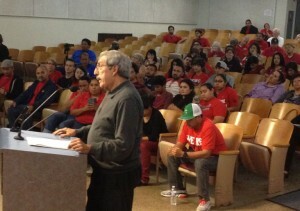 ¡Felicidades To All Compas Of Unión del Barrio Across Southern Califas! 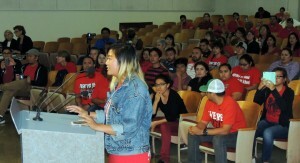 This entry was posted in 2015, 2015 Statements, Barrio Youth News & Events, Cultural News & Events, Higher Education News & Events, K-12 News & Events, Local Community News & Events, San Diego News & Events, Solidarity. Bookmark the permalink.